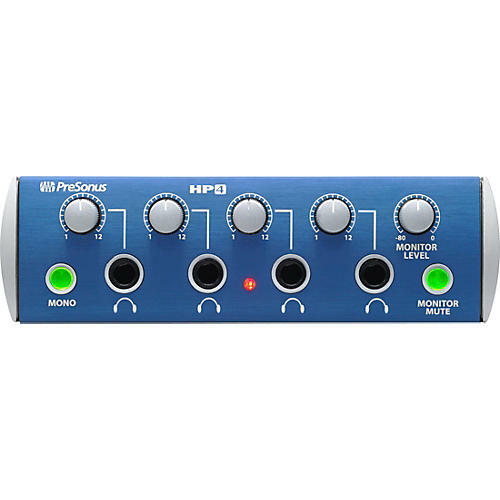 The PreSonus HP4 Discrete 4-Channel Headphone Amp features 4 headphone outputs on the front panel, each with its own volume, and 150mW of amplification per channel-extremely loud output with a low -98dB noise floor. It also allows control over control room monitors with a separate volume knob that can be muted using the Monitor Mute button. 1/3 rackspace. Accepts balanced/unbalanced inputs and outputs (1/4" TRS). Input can either be set to stereo or mono (the mono selector button on the front channel simply copies both inputs to both sides). Powered by an external wall-mounted supply. Dimensions (W x D x H): 5.5" x 5.5" x 1.75"